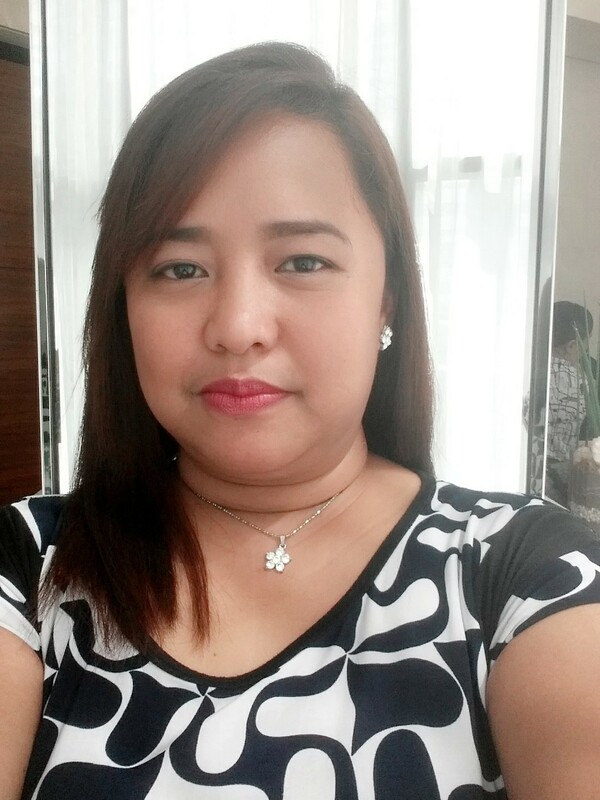 The Christmas season is party season for my family. This is also the season of family reunions, potluck lunches and dinners, and get togethers with friends. 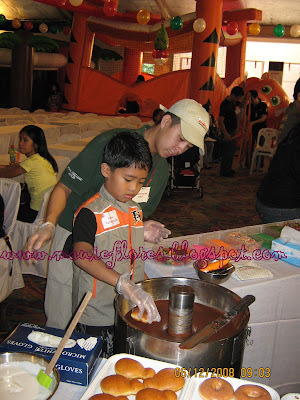 The first party for us this year (and almost as always) is the kiddie Christmas party that my husband's office held for their employees' children. 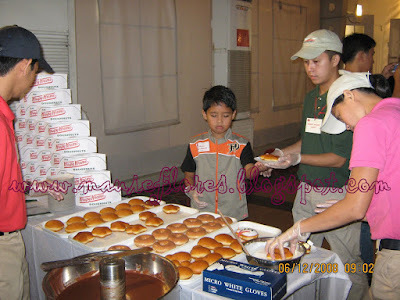 We celebrated last December 6 at the Rockwell Tent. Normally, most companies in the country only hold Christmas parties for their employees. If the budget is big enough, the spouses are included in the list. But hey, it's not called Buhay Coke (The Coke Life) for nothing! 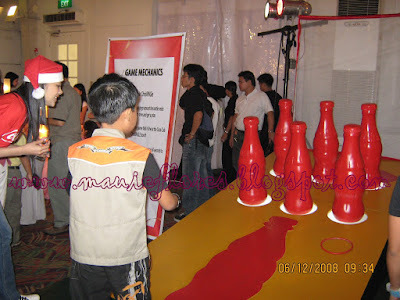 True to their promise, the Coca-Cola Company has, once again, spread the Christmas cheer to all the kids who attended that day! 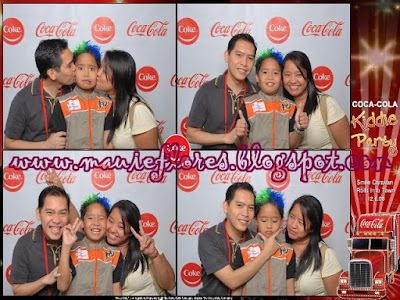 These pictures were taken at the Party Pics booth that was set up outside the tent. 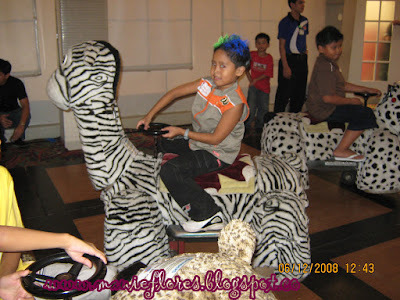 Read on to find out why my son's hair is like that. We left the house at around 7:30 am to avoid the Saturday morning traffic. We just bought 2 orders of large fries and iced tea for us to eat while on the road. When were lucky to arrive a little earlier than the others because finding a parking space is really hard in the place when the Powerplant Mall is still closed. Ralph got his Christmas loot from Coca-cola. 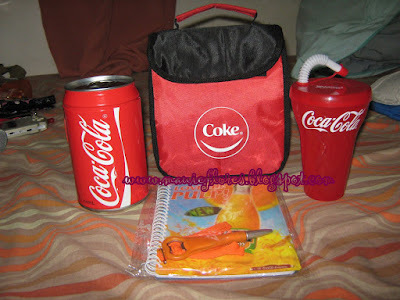 Inside a red and black Coke lunchbox was a cute Coke in Can coin box, Minute Maid notebook and pen, and a shiny new red Coke tumbler that was filled with goodies! The party started at exactly 9 in the morning. 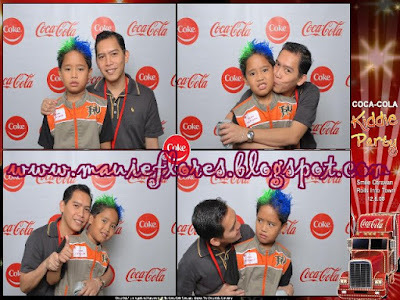 We were supposed to be lining up for the Party Pics booth before going inside the tent but we opted to had our pictures taken when the long queue is done. I'm glad that we did that because we were able to get good seats. 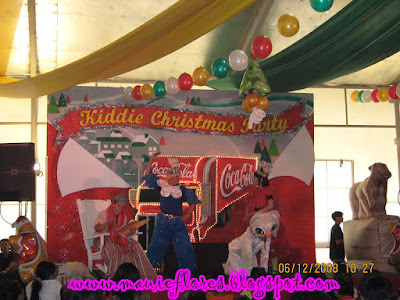 It is usual for a Coke Kiddie Christmas party to have lots of activities set up in the place for the kids to enjoy. 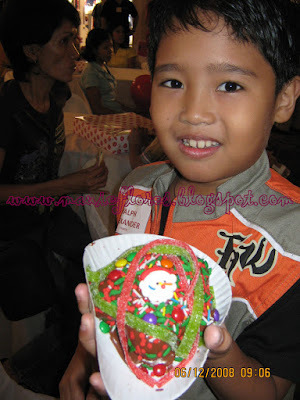 Rap decided to decorate his Krispy Kreme donut first before moving on with the other activities. Rap chose the star-shaped donut. The program did not start yet so we got ourselves in line for a photo op with Santa Claus. This is another Coca-Cola Christmas tradition. I am not posting the picture that I took from my camera here because I accidentaly deleted it. (Please don't blame me because I am really feeling bad about it for days now.) We have to wait for the copy that will be released by the company's photographer. Hay! 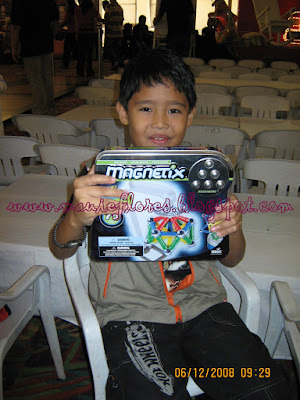 Rap got a Magnetix set from Santa that day and that's what matters now! He's so busy nowadays creating anything that comes to mind with his magnets. 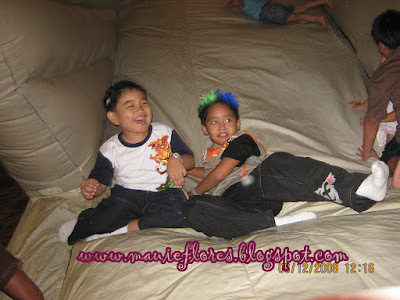 There were inflatable playgrounds set up inside the tent for all of the kids to enjoy. 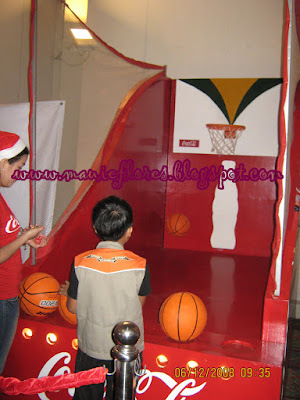 Timezone provided some token rides and Coke game booths were also set up for the kids to play. Rap tried his skills in basketball and shooting rings in Coke bottles. He got cute keychains as prizes for his efforts. 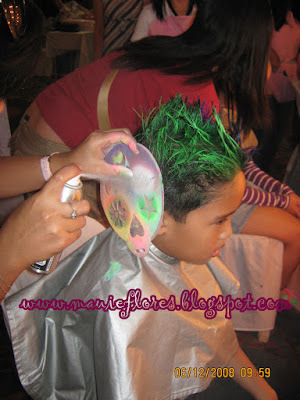 Rap was also able to have his hair fixed at the Kiddie Salon booth. This explains why his hair was dyed green and blue in our family photo. We lined up for the Party Pics booth right after he had his hair done. I think he looked cool in the pictures! 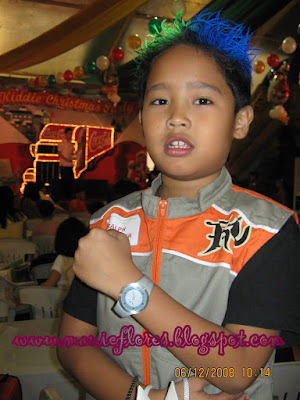 We are also happy that Rap was able to bag a watch from the party's raffle draw. We were able to finish our round up of the party booths just in time to watch PETA's presentation of "Ang Mga Kwento ni Lola Basyang. I honestly enjoyed this part of the party not because it's something new but also because the stories teach values to the children. PETA actors acted out three stories of Lola Basyang in a jolly and unorthodox version. The script was funny and the kids were able to interact with the actors. The costumes that the actors wore were unique and funny too. 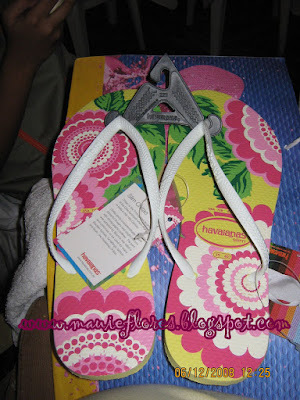 It made me think of various arts and crafts activities for my students! The party ended with my husband's staff and our good friend Renan' baby winning the much coveted Nintendo Wii. We went home with lots of goodies, food, and Coca-cola products! 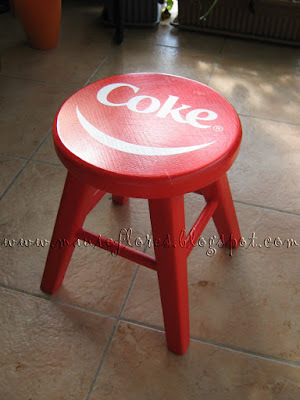 Oh, and before I forget, Rap took home this cute Coca-cola stool as a souvenir. 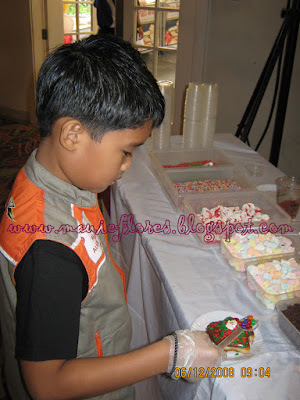 With the kiddie party done, my husband and I can now move on to prepare for his department's Hawaiian-inspired party and the company's Mardi Gras inspired party that will happen within this week! Costume suggestions anyone?